From the June issue: The number of closed Manhattan condo resales fell for the third straight month in April, with only 65 recorded transactions, an analysis by The Real Deal found. The median price was $1.55 million, up from $1.4 million in March. New development prices in the borough hit their highest point in the last 12 months, reaching just over $4 million. 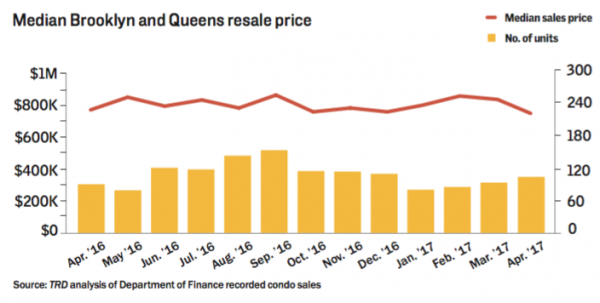 In Brooklyn and Queens, condo resale prices slipped to a median of $758,500 from $828,750 the month prior. New-development prices fell to $824,783 from just over $901,000.